The Larson scanner is named after Glen A. Larson, the man responsible for producing both the original Battlestar Galactica and Knight Rider television shows. Need an for your Cylon or Gort costume? We've got you covered. 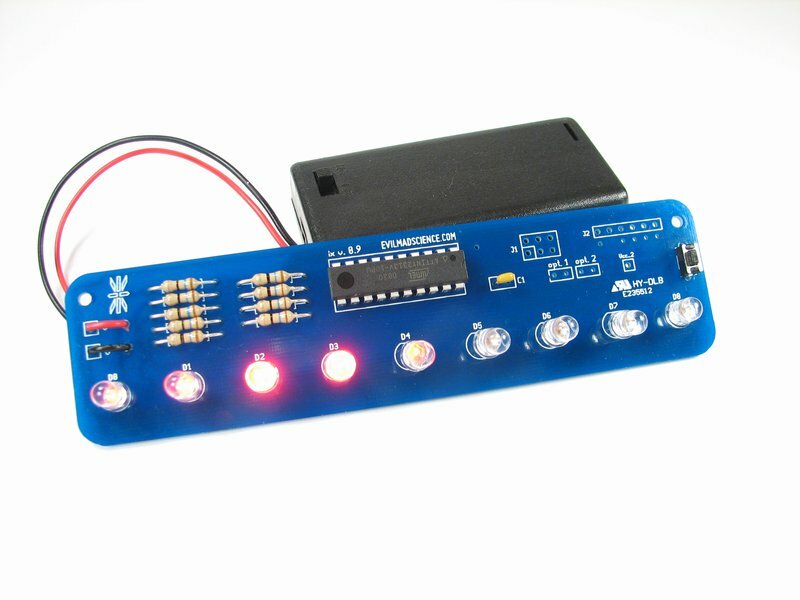 The kit is very easy to build, and includes a pre-programmed microcontroller, battery holder, and nine ultrabright red LEDs. 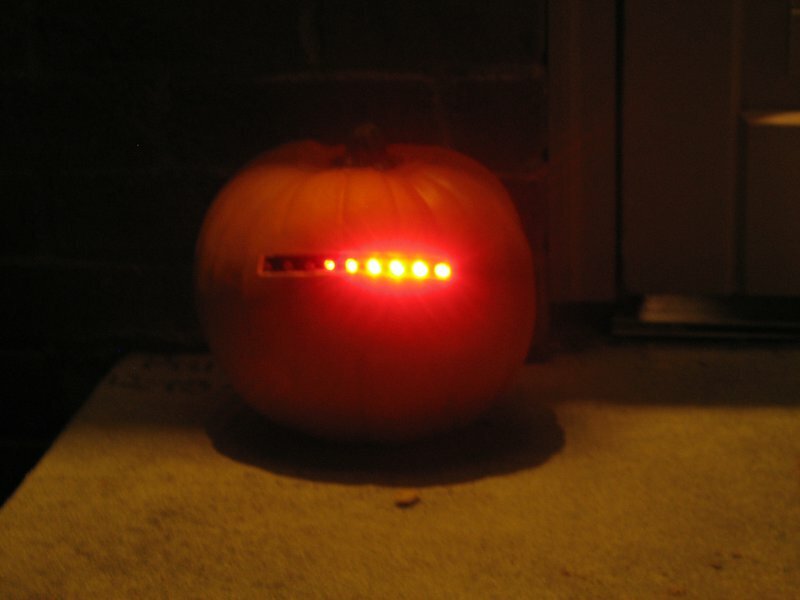 Once you've built it, you'll have a beautiful back-and-forth scanning red light, ready for incorporation into various sci-fi props, costumes, and pumpkins. The kit is available with your choice of two different styles of ultrabright red LEDs: 5 mm (standard size LEDs) with clear lenses, or 10 mm (huge LEDs) with diffused lenses available here. 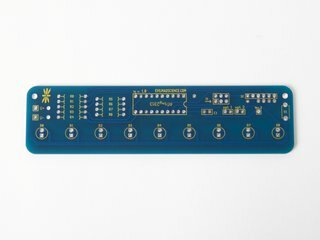 The Larson Scanner is sold as a soldering kit [?]. 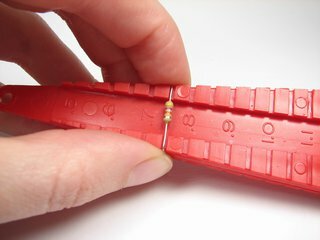 Basic electronic soldering skill is required, and you provide standard soldering tools: a soldering iron + solder and small ("flush") wire clippers. No additional knowledge of electronics is presumed or required -- and no programming is required either. 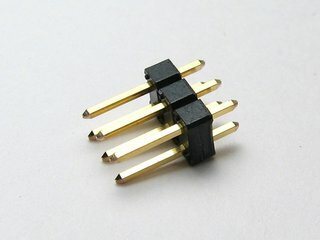 Easy "through-hole" construction ("No surface-mount nothin' nowhere!"). Clear, full-color printed instructions are provided with the kit. If you would like a preview, you can download a copy of the assembly guide here (3.8 MB PDF file). 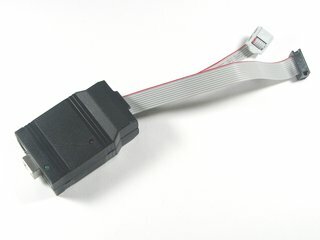 This is an open-source project, designed to be hackable. Design files and source code for this project can be found at Evil Mad Scientist Wiki. The circuit board itself is 5 x 1.3" in size (12.7 x 3.3 cm). 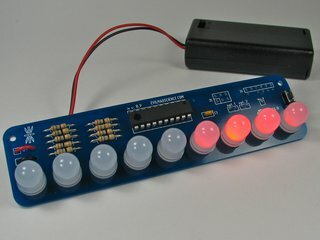 The current shipping version of the Larson Scanner kit has firmware version 1.4, which can be optionally configured into Kraftwerk-inspired LED tie mode. Larson Scanner kits are RoHS compliant (lead free). 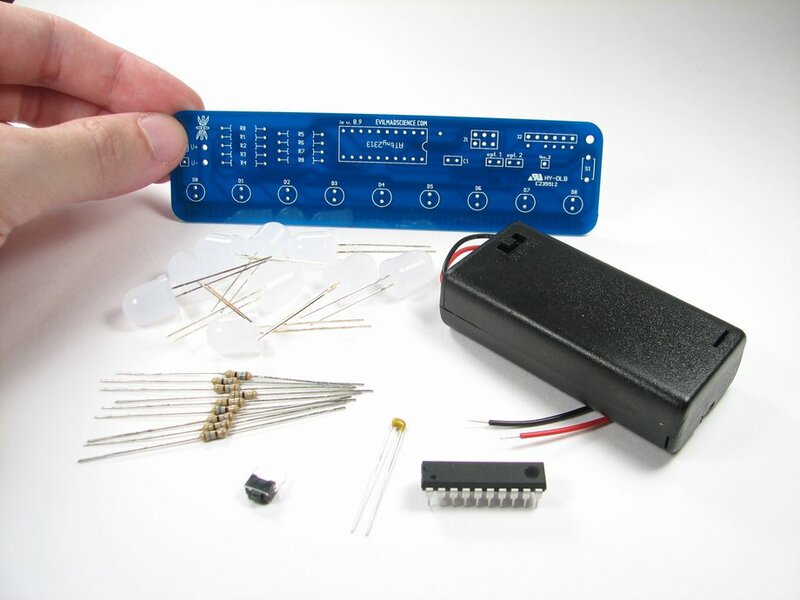 If you're building one of our kits, you'll find that everything works well with either regular or lead-free solder-- whichever you care to use.